Reflective Hard Hat Rocker, 3" x 6.875"
“Explorer” crescent rocker Hard hat decals are an added value to your safety program. Our Crescent Decals are durable and are ideal for Hard hats, helmets, and to identify equipment. 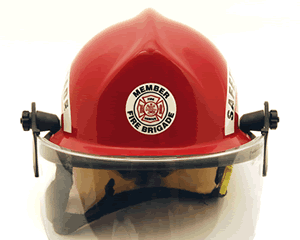 • Rocker decals can be used on either fire fighter helmets or on hard hats. • Reflective Spot-a-Hat™ material is great for emergency and nighttime viewing. Decals are conformable and can be applied without wrinkling. • Rocker decals are generally applied to both side of the hat or helmet. That way you quickly see the worker’s title – from both sides. We sell the rocker labels as individual decals. Order two if you want to apply these to both sides of your hat or helmet. • Spot these labels with a flashlight or headlight - great for emergencies, blackouts, low light areas or work outside in the evening. • Spot-a-Hat™ labels use a premium version of 3M's Scotchlite material that is designed with patented reflective film. Variegated liner creates a bubble-free application and easy repositioning. Unlike other Scotchlite films, this material is not brittle and partially conforms to the curves of your helmet or hat. • High performance adhesive sticks well to hard hat or helmet surfaces - yet can be removed cleanly, if you want. Labels last for years. • Spot-a-Hat™ reflective vinyl has a silvery color. Labels are printed digitally with a spot color printing process. • Reflectivity is a great safety feature. Label material is also used by firefighters for their trucks and helmets. Spot-a-Hat™ labels are reflective in both wet or dry conditions. • Spot-a-Hat™ labels offer superior outdoor durability (5+ years).